Happy Thanksgiving to you and your family, Linda! I have loved reading about your tea and thank you so much for sharing your recipes! Happy Thanksgiving! 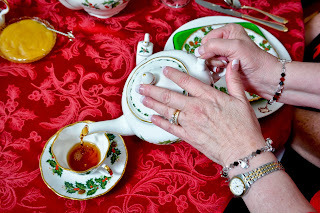 I want to register too - would love to see your featured home tea room! Linda, Happy Thanksgiving to you and your family. Enter me into your Kentucky Living Magazine giveaway. I know your list of Thankfuls this year is fuller than ever---I'm so glad everyone in your family is well, and that you all are enjoying your gathering for Thanksgiving. You and your bright spirit and beautiful sharings are high on my own list, as well. So glad you've found ways to enjoy your holiday teas and still stay within your special dietary restrictions. I'm proud of you. Sometimes the holidays can tempt us entirely too much. I've so enjoyed reading about your Christmas tea and would love to have a copy of the magazine, Linda. Your tea was an inspiring and beautiful one. I would love winning this magazine issue. I hope your Thanksgiving was a very special day. Oh, this would be such fun to have! Congratulations again!! I think you have my email. And I am just so excited for you. And I would love to win a copy, too, I have enjoyed reading about your photo shoot. Joyb414 at hotmail dot com should find me! Oh, yes, I would LOVE to win a copy! Thanks for the chance!